Abbott’s kiss of death to G20 Brisbane. What leadership? 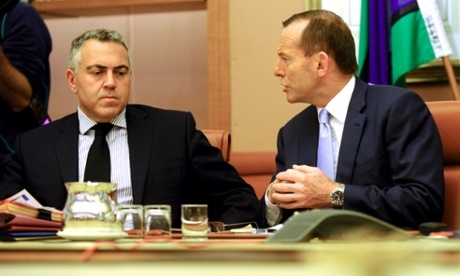 Abbott and Hockey in tense G20 discussion. The good ship G20 is adrift, rudderless, on the turbulent high seas of international finance. It has been for some years. The G20 is widely held to be ‘in serious transition‘ according to Canadian academic Professor Andrew F. Cooper. Whilst it won praise for being a unique forum for global economic cooperation in the GFC, it has failed to deliver on a series of pressing international issues. Climate change, growing inequality, growing unemployment, the global decline in the value of wages to GDP are but a few of its many pressing challenges. Whilst it would be unkind to say that the G20 has achieved little so far,clearly there is much work to be done. Is it up to the job? Is Australia up to the job of providing desperately needed leadership? Are we serious? Or are we putting lipstick on a pig? The evidence so far is damning. The G20’s role during the GFC has been embellished. No record of decisive action or intervention exists to support its glowing reputation in some quarters. Apart from a few fans who talk it up, the balance of opinion is yet to be convinced. Expert observers and analysts differ on how useful it was even as a forum. Action by the US Federal Reserve and Treasury, together with a G20 commitment not to raise trade barriers; fiscal expansion and agreement for tripling IMF ‘firefighting’ capacity, made a vital contribution to changing expectations to arrest a potential global economic free-fall. This is a popular view. Yet others remain to be convinced. Chris Berg dismisses as ‘a fantasy’ the idea that the G20 played any significant role in the GFC. Certainly, he argues, it played no coordinating role; nations more or less acted on their own, with more or less success. Yet the G20 has good intentions. Its aim of a GDP increase of 2% is a step in the right direction. But there is no action plan; no clear case that 2% is enough and no plan on how this might be achieved. No real leadership has been shown by the chairman, Tony Abbott. Indeed, so little has Abbott contributed so far that Australia’s turn to play host at a time of mounting international crises could well spell the kiss of death for the G20. So far, Tony Abbott has conducted one brief photo opportunity and made the statement that this is the most important meeting in Australia’s history, ever. If this is the extent of his contribution, he risks appearing to treat the G20 with cavalier contempt. Cynics would reply that he needs to do less telling how important it is and do something to show that he himself recognises it. Optimists point out that there is still one week to go and we might yet see his grasp tighten. Ironically, Abbott’s statement of the meeting’s importance echoes Tania Plibersek’s words when she expressed dismay in June that whilst visiting the USA, Abbott cancelled key meeting with the world’s top financial officials. It was as if he could not grasp the G20’s status let alone his role in it. Now he’s making a point of telling us he knows it is important. Whatever its importance, without any leadership, without any concrete plan to match its lofty rhetoric, the G20 is like the Cheshire cat, in danger of vanishing, leaving nothing behind but its smile. Or is it a case of kiss me and wave me goodbye; the kiss of death? Tony Abbott may well have concluded that the G20 is moribund and perhaps he has resolved to hasten its demise by cynically accepting the public kudos of chairmanship without any of the responsibility. Leading the premier group of economies for international economic cooperation and decision making is a rare privilege. It is a coveted global leadership role. Australia needs to fully utilise it if we are to live up to our reputation as a nation that punches above its weight. It is also an opportunity to deliver on a number of reforms we have long advocated through the G20, reforms that have domestic and international upsides. Will the G20 sail itself? It has such a motely crew that it demands a captain. Of course, the G20 has its technocrats to do the real work and Abbott’s light touch at the wheel will not have deterred G20 boffins from working on what Joe Hockey described in June as a ‘back to basics approach’. What this means precisely is unclear but given the publicity from the prior gathering, the 16 November meeting will focus on economic growth. This is a worthy topic. Unemployment, poverty and inequality are increasing world-wide. Sustained long-term growth is vital to meet these challenges. But whilst Joe Hockey wants to set course towards 2% growth, this is not enough to fix the pressing problems. Nor is his government’s dry economic agenda likely to prove anything but a hindrance. A fixation with ‘fiscal consolidation’ and a narrow view of infrastructure spending, his government’s signature, will not fix growing unemployment. The Abbott government has a die-hard laissez-faire attitude to promoting economic growth. Nothing original here. And there is plenty of evidence that it will not, cannot work. Leaving the market to create growth all by itself does not match the G20 experience in the GFC. Nor does it match today’s G20 rhetoric. It suggests a lazy retreat into ideology and the ignoring of the lessons of experience. Abbott talks of lowering wages. He uses the weasel-word ‘flexibility’ to signify paying workers less. He talks of imported workers from China and India. It is understood that this is a cost reduction exercise. Bosses hire workers at lower wages. Reducing wages costs will make them employ more people. Yet it remains a theory. Not only is it without evidence, it is also out of date: current developments in economic policy support raising minimum wages as a way of increasing demand for goods and services. In turn employment across the industries grows to meet the increased demand, domestically and globally. Businesses make more money. This parallels stimulus packages used during the global financial crisis to promote economic growth. There are many other ways in which the Abbott government is totally at odds with G20 thinking. Out of touch with what leaders know has worked in the GFC. Its privatization perspective on infrastructure is but one example. Overall it is so totally at odds with current G20 thought and practice that it is difficult to see the Prime Minister as being equipped to even contribute to discussion, let alone lead the G20 on 16 November. Even if he was properly prepared. Even if he had a plan. « Blood on Scott Morrison’s hands.